EBC concedes it still lacks the evidence to pursue options B and C in its Local Plan. Thank you! ADD UPDATE, 23 July 2017: Thank you very much to everyone who came to Hedge End last Thursday evening for Eastleigh Borough Council (EBC)’s meeting on its emerging Local Plan and to protest against the council’s preference to build 5,200 new houses and a major new road north of Bishopstoke and Fair Oak (options B and C). Thank you too to all of you who delivered leaflets, held placards, and sent messages of support in your absence. The meeting was absolutely packed (around 500 people) and even required a video link to the foyer! As expected, it was a marathon meeting but we firmly believe that our message is getting through to councillors that they must work harder to engage with the community. Significantly, the council made a last-minute change to the motion in order to emphasise the point that it doesn’t yet have the evidence to make a decision on which of the two ‘strategic growth options’ (SGOs) it should pursue. This followed a challenge from ADD earlier in the day when we presented legal opinion from our planning barrister, Hereward Phillpot QC, explaining that voting on the original motion would have jeopardised the chances of the Local Plan being approved by the planning inspector next year. Not only does a Local Plan have to be based on evidence, but every step in the process must be evidence based too. Evidence cannot therefore be collated retrospectively. Eastleigh is still without data and analysis on traffic modelling, habitats and even on the number of houses needed. Whilst we welcomed the council’s last-minute concession, we think it is unlikely to have been sufficient to satisfy the planning inspector next year. This is because the progress that councillors were asked to “note” showed a clear preference for options B and C and made little mention of the other options nor any suggestion of testing them further. Representatives from many parish councils spoke including Bishosptoke, Fair Oak and Horton Heath, Colden Common, Upham, Owslebury and West End. All bar West End expressed deep concern about options B and C. West End representatives made clear that option E (in Allington Lane) was of concern to their residents, but they were also keen not to promote options B and C.
Richard Izard, chair of Colden Common and a Winchester City Councillor, complained about lack of consultation and predicted that, in their current form, the council’s plans would not be accepted by the planning inspector. Sue Cook, a Twyford parish as well as a City Councillor, criticised EBC for lack of communication and failure to co-operate with Winchester City Council and the parish councils that border options B and C in Winchester’s district. Jack Taylor, a campaigner from the Woodland Trust, outlined why building close to sites of ancient woodland (there are five in options B and C) damages the woods and why the woodlands matter. Jeremy Legge, Director of the Test and Itchen Association, spoke about concerns over the Itchen (which the planned new road would have to cross), as did Mark Lloyd, Chief Executive of the Angling Trust, who described the Itchen as “our coral reef, our rain forest” – such is its significance as a natural habitat. During the meeting, it was also announced that Friends of the Earth (Southampton and Eastleigh) had also thrown its weight behind the campaign to stop options B and C.
Representatives from the Campaign to Protect Rural England, the Bishop’s Waltham Society and Stokewood Surgery also shared their concerns about options B and C, whilst representatives from local Scouts and Brownies emphasised how important the countryside is for children’s development and how – if options B and C went ahead – local children may not be able to afford to travel to further afield to access it. Mims Davies, MP for Eastleigh, spoke about the importance of Local Plans and how significant she believes support for ancient woodland should be. She is Vice Chair of the All-Party Parliamentary Group on Ancient Woodland and Veteran Trees. After a short break, the councillors debated the motion. Most expressed how they wanted there to be more engagement with the public and organisations and that decisions should not be taken ahead of the evidence. Indeed, several Lib Dem councillors said they were relieved that they were not being asked to choose options B and C that evening because they would have had to vote against on the basis of what had been put before them thus far. That said, the motion to “note progress” – something Keith House, leader of the council, stressed several times – was carried. The vote was recorded and several councillors voted against or abstained, including some of the Lib Dems. ADD is pleased that the councillors stressed that they were not ready to take a decision, and we welcome the call for greater dialogue. But the meeting does call into question the council’s ability to gather a full suite of evidence in line with its timetable (its aim is to submit its Local Plan to the Secretary of State next spring). Indeed, unless the expressed desire to engage and cooperate is acted upon, and pros and cons of all the options are properly evaluated, Eastleigh runs the risk of being without a Local Plan for even longer than anticipated. 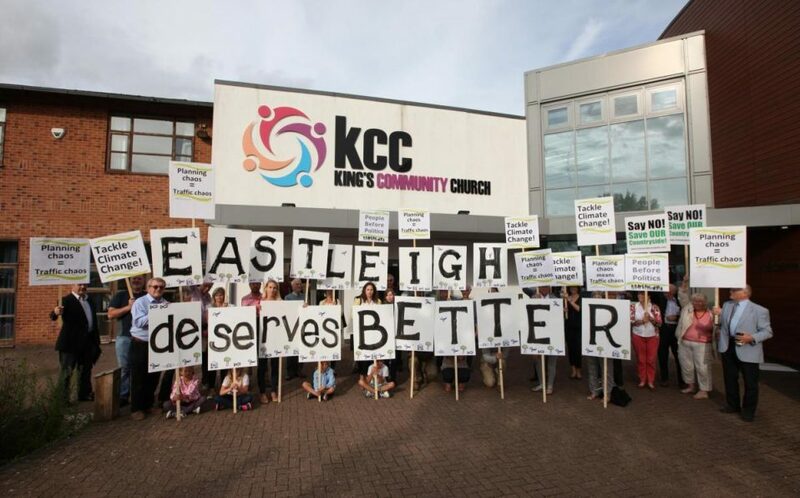 With the support of thousands of local residents and many local and national organisations, we will continue our fight for an evidence-based Local Plan for Eastleigh until our battle is won. Thank you again to everybody who has supported us so far. Please keep spreading the word about EBC’s shocking plans. We need everyone to know and as many supporters as possible for the cause. Your ticket for the: EBC concedes it still lacks the evidence to pursue options B and C in its Local Plan. Thank you!